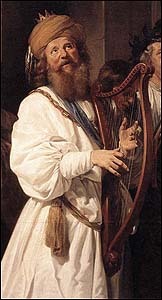 Detail of "David Playing the Harp" (1670) by Jan de Bray (Dutch painter, 1627-1697), oil on canvas, 142 x 154 cm, private collection. Larger image. 14"But who am I, and who are my people, that we should be able to give as generously as this? Everything comes from you, and we have given you only what comes from your hand. 15We are aliens and strangers in your sight, as were all our forefathers. Our days on earth are like a shadow, without hope. 16O LORD our God, as for all this abundance that we have provided for building you a temple for your Holy Name, it comes from your hand, and all of it belongs to you. 17I know, my God, that you test the heart and are pleased with integrity. All these things have I given willingly and with honest intent. And now I have seen with joy how willingly your people who are here have given to you. 18O LORD, God of our fathers Abraham, Isaac and Israel, keep this desire in the hearts of your people forever, and keep their hearts loyal to you. 19And give my son Solomon the wholehearted devotion to keep your commands, requirements and decrees and to do everything to build the palatial structure for which I have provided." 20Then David said to the whole assembly, "Praise the LORD your God." So they all praised the LORD, the God of their fathers; they bowed low and fell prostrate before the LORD and the king. Prayer isn't just asking God for favors or forgiveness. It is much more than that. A great part of Spirit-inspired prayer is praise, if the Book of Psalms is any indication. On the Day of Pentecost when the Holy Spirit fell upon the church in Jerusalem, people heard them in dozens of languages "declaring the wonders of God in our own tongues" (Acts 2:11). "Wonders" (NIV), "wonderful works" (KJV), and "deeds of power" (NRSV) translate the noun megaleios, "greatness, sublimity ... mighty deeds. "1That is indeed the content of many of the Psalms and the psalm we will examine today -- extolling and worshipping God in his greatness, glory, and splendor. You probably participate in this kind of worship in some of the great hymns of the faith, such as "Great is thy faithfulness, O God, our Father...." or "O worship the King, all glorious above...." or "Holy, holy, holy, Lord God Almighty, all thy works shall praise thy name in earth and sky and sea...." Some of our modern praise choruses lead us in praise, also. But do you, dear friend, practice this kind of praise in your own personal devotions? You can. I hope from examining this psalm you can learn the elements, and then try them out in your prayers. Leading up to our passage, the aged and ailing King David calls to his palace all his officials, military leaders, and administrators. Now the weak king stands to his feet to address them concerning the temple to be built during his son Solomon's reign. Then he presents to Solomon from his own personal fortune gold, silver, and bronze in great quantities to build the temple and calls on the leaders and officials present to contribute also. They respond with great generosity. "Rejoice" (sāmah) denotes "being glad or joyful with the whole disposition. "2This is an instinctive response to generous and godly behavior. Our generosity can touch others; so can our stinginess. "Willing" and "freely" (NIV) in verse 9 both translate the verb nādab, which "connotes an uncompelled and free movement of the will unto divine service or sacrifice. "3This word appears again and again in our passage. It reflects God's desire for our worship in giving as well as our worship in praise -- uncompelled and free giving of ourselves. Sometimes we give because of a sense of duty. Duty is good; I don't want to discourage duty. But giving out of love, "freely, willingly" is even better. The New Testament equivalent of this is: "Each man should give what he has decided in his heart to give, not reluctantly or under compulsion, for God loves a cheerful giver" (2 Corinthians 9:7). Notice here that leaders -- beginning with David himself -- set the example of giving. That inspires followers to the same selfless attitude. We leaders need to rededicate ourselves and our finances to God so that we can be leaders in giving, not just in administrative or so-called spiritual things. Giving is as spiritual as it gets, since giving gets to the roots of our faith, our future, and our surrender to God. We'll examine these and others as we get to them in our text. But let's look at the first. "Praised" (NIV) and "blessed" (KJV, NRSV) is bārak, "to bless, to endue with power for success, prosperity, fecundity, longevity, etc. "4The word is often used in the Bible in connection with the hands, though this passage doesn't mention it. Abraham, Jacob, and Jesus lay on hands to bless children. Both Aaron (Leviticus 9:22) and Jesus (Luke 24:50) lift up their hands in blessing and benediction (from a Latin word, benedictus, which means "blessing."). It is not surprising to learn that praying with lifted hands was the common position of prayer for the Israelites, because they were blessing God himself with their hands, hearts, and voices. (For more, see my article "Lifting Hands in Worship," Paraclete, Winter 1986, pp. 4-8. www.joyfulheart.com/scholar/hands.htm). Q1. In what way do our prayers of praise "bless" God? What do we mere humans have that God desires in a blessing? What are prayers like, that don't include blessing God? Now he begins to ascribe or attribute to God various qualities of might, strength, and glory. Is praise just flattering God? Buttering him up so you can ask a favor? By no means! Praise is expressing out loud the respect and honor we have for our God. That we are willing to openly declare God's greatness encourages others to see God in this light and honor him as well. "But thou art holy, O thou that inhabitest the praises of Israel." "Yet you are holy, enthroned on the praises of Israel." "Yet you are enthroned as the Holy One; you are the praise of Israel." "Inhabitest" (KJV) or "enthroned" (NRSV, NIV) is yāshab, "sit, remain, dwell. "13There is a sense in which God's presence is often intensely apparent within the context of a praising congregation. Our praises "enthrone" him here on earth. A sense of awe and love is felt by many in the room. I don't think this is just group think or emotionalism, but a real spiritual manifestation of God's own special presence. It is significant that David the King acknowledges that the kingdom belongs to God. Many monarchs -- and people like you and me -- perceive themselves as absolute rulers of their domain. But not David. For him, Yahweh is both the ultimate King and Head. "Kingdom" (mamlākā), from the root for "to rule as king," refers to those who are subject to his rule, his subjects, as well as the right to rule.14Israel's understanding of their line of kings was that Yahweh was the true king. The tabernacle in the desert (and later the temple in Jerusalem) depicts the tent of a great desert monarch. The ark is his throne, the Holy of Holies his throne room. The Holy Place typifies where the king would be served with food, incense, and light. Eventually, Israel called for a king (1 Samuel 8:4-9), but it was understood that human kings rule on his behalf, not as substitutes for his rule. I exalt Thee, O Lord. Q2. In what way does praise exalt God? Why should we exalt God? What does this exaltation do in us? What does it say about us? 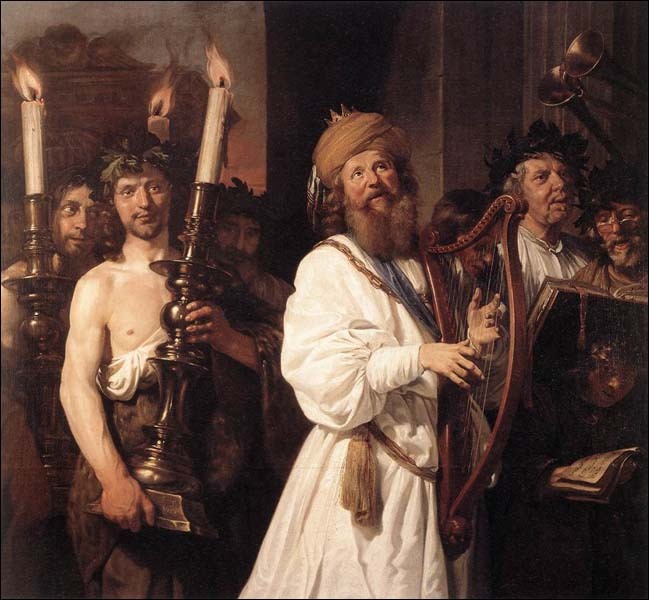 Now David continues to attribute or ascribe qualities of strength and power to God. See the similarities with praise in our psalm and in the Book of Psalms? Praise focuses on who God is, not on our experience or feelings. Praise exalts our God. Q3. Verses 11 and 12 both attribute various characteristics to God, such as glory, honor, and might. How might you begin to mention God's greatness in your own prayers? Where is this kind of praise found by example in the Lord's Prayer? What are your favorite songs that point to God's greatness? "Praise" (hālal), "praise, boast." The root connotes being sincerely and deeply thankful for and/or satisfied in lauding a superior quality(ies) or great act(s) of the object. The most frequent use relates to praise the God of Israel, with nearly a third of such passages occurring in the Psalms, often imperative summons to praise.25 The word "hallelujah" comes from this root. While we believe this theoretically, we are very tempted (1) to believe that we earned our own way by the sweat of our own brow and (2) to hold our possessions tightly as our own. This is where we get in trouble with God. It is at this very point that we balk at tithing a full 10%, for example, because we believe that our wealth belongs to us rather than to God. David's prayer reminds us: "It comes from your hand, and all of it belongs to you" (29:16). Q4. Why is a person's attitude with regard to giving related to that person's attitude towards praise? Why does an attitude of possessiveness with regards to giving get in the way of worship? In what sense do all your possessions belong to God? What then should be your relationship to your possessions? How will these truths re-energize your giving? Your praise? Now David prays that this willingness and generosity towards God continue among the people after he is gone. He also prays for his son Solomon, who will ascend to the throne at his father's death. Finally, David calls the people to praise the Lord, too. Candidates for Catholic priesthood lie prostrate in the service of ordination. "Praise" and "bless" in verse 20 is bārak, which is used in verse 10 above. But here is our final praise vocabulary word for today. Notice the people's posture -- bowing low30and falling prostrate. This last word "fell prostrate" (hāwā, NIV) or "prostrated themselves" (NRSV) is usually translated as "worship" in the Old Testament. It is the posture of complete submission before a superior. To bow oneself low before God is the essence of worship. Kneeling and bowing low is the common Muslim prayer posture. But Christians only bow their heads in prayer, except in Catholic and Anglican churches that have kneelers. Why is this? 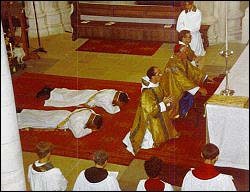 Priests in the Catholic tradition lie completely prostrate at their ordination. Consider trying this posture in your prayers -- not as your only posture, but as a sign and symbol of your deep worship and surrender to God. We have studied David's last recorded prayer, a prayer at the end of life. It is a psalm of praise, a song extolling the attributes of God, a prayer of wonder at God's rich blessings, a prayer for the next king, and a call to deep worship. What can you incorporate in your prayers that you have learned from this prayer? O Lord, sometimes our worship seems so half-hearted, our praise so faint. Teach me, teach us to praise you with all our heart, soul, mind, and strength. Make us a people of praise, who love to praise you. And teach us to hold only loosely the wealth you have entrusted to us. Help us to give willingly and freely, we pray. In Jesus' name. Amen. Bruce K. Waltke, sāmah, TWOT #2268. Leonard J. Coppes, nādab, TWOT #1299. John N. Oswalt, bārak, TWOT #285. The verb bārak is possibly be related to the verb "to kneel," as the related berek means "knee." Israel here refers to the patriarch Jacob. "Everlasting" is �ôlām, which usually indicates "indefinite continuance into the very distant future, forever, ever, everlasting, evermore, perpetual." Allan A. MacRae, �ôlām, TWOT #1631a. Elmer B. Smick, gādal, TWOT #315e. John N. Oswalt, gābar, TWOT #310c. Victor P. Hamilton, pā�ar, TWOT #1726b. Milton C. Fisher, nāsah, TWOT #1402a. Walter C. Kaiser, yāshab, TWOT #922. Robert D. Culver, mālak, TWOT #1199f. William White, rō�sh, TWOT #2097. Walter C. Kaiser, nāsā�, TWOT #1421. "I Exalt Thee," words and music ©1977 by Pete Sanchez Jr.
"Wealth" (NIV, �ōsher) and "riches" (KJV, NRSV). "Honor" (kābōd) comes from the root "to be heavy, weighty," and figuratively, "a 'weighty' person in society, someone who is honorable, impressive, worthy of respect." When referring to God kābōd, "glory of God" far surpasses any earthly honor, since the near-blinding quality of God's glory fills the earth, and can refer to his very presence and character. John N. Oswalt, kābēd, TWOT #943e. "Strength" (NIV) and "power (KJV, NRSV) is kôah, "strength, power, ability, might, force, substance, capacity to act, understood both in physical and figurative terms." When applied to God, this term suggests that he is indeed omnipotent. John N. Oswalt, khh, TWOT #973a. "Might" (gebûrâ) which we saw in verse 11, pictures God as the ultimate mighty warrior. "Exalt" (gādal) is the verb "promote, exalt, make powerful, make great." Elmer B. Smick, gādal, TWOT #315. "Give strength" (hāzaq) from the basic meaning "be(come) strong." Carl Philip Weber, hāzaq, TWOT #2388. The basic difference between yādā and its synonym hālal, is that the latter term tends to stress "acclaim of, boasting of, glorying in" and object, while yādā emphasizes "recognition" and "declaration" of a fact, whether good or bad. Ralph H. Alexander, yādā, TWOT #847. Leonard J. Coppes, hālal, TWOT #500. "Give generously" (NIV), "offer willingly," and "make a freewill offering" (NRSV) is nādab, which we first saw in verse 9 and occurs twice in verse 17. Leonard J. Coppes, nādab, TWOT #1299. "We Give Thee but Thine Own," words by William W. How (1864). "Integrity" (NIV, yōsher) and "uprightness" (KJV, NRSV) has the idea of "uprightness, straightness," from a root that denotes going on a straight path. Donald J. Wiseman, yāshar, TWOT #930b. "Wholehearted devotion" (NIV, shālēm), "perfect heart" (KJV), and "single mind" (NRSV) use the Hebrew word for "heart" along with the verb "be complete, sound," carrying the idea of completion and fulfillment, of entering into a state of wholeness and unity, a restored relationship." The Hebrew noun shālōm, "peace, wholeness," comes from this word group. G. Lloyd Carr, shālēm, TWOT #2401. "Bow" (qādad), refers to "bowing of one's head accompanying and emphasizing obeisance," emphasizing devotion and deep awe. Leonard J. Coppes, qādad, TWOT #1985. This Eshtaphal stem of hāwā means "to prostrate oneself, to worship." The verb originally meant to prostrate oneself on the ground, a common act of submission before a superior, similar to Muslim prayer with an elaborately prescribed suğ�d in which the forehead must touch the ground. The Greek equivalent is proskuneō, which can mean either "prostration" or "worship." Edwin Yamauchi, hāwā, TWOT #619.